Club Penguin Cheats by Mimo777 Club Penguin Cheats by Mimo777: Club Penguin's Happy77 Talks Cart Surfer! Expert #1 - "Do lotsa backflips!" Expert #2 - "Grind all the corners." Expert #3 - "Crash on purpose to buy more time! Seriously!" Cart Surfer is a great way to earn extra coins for the new igloo and furniture catalogs that will be out on Friday. Cart Surfer is definitely a fun way to get coins, but what is your favorite way to earn some coin? Carf surfer is pretty cool! Cool! I am going to play cart surfer now! My fave way is to play Aqua Grabber or Dance Contest. Dance Contest and That game at the Beacon i forgot the name. Cart Surfer is my fav too! I also like aqua grabber and catchin waves. then you do a backflip again and then the jump and right arrow key again an continue with that you get 100 points for backflip and 80 points for the other one. i like playing aqua grabber or the games in the nightclub. I'm not an expert at cart surfer but it's fun to play I guess. My fav game to earn coins is puffle roundup, the dance competition and the Pizza game lol! i like puffle round up, dance contest and cart surfer! p.s. mimo777 rocks the web!!!!! I thing aqua grabber is better cuz the one with the giant clam, you can get all of the small pearls and get 750, and the giant pearl's like a thousand or something, right? I like cart surfer but it would be cooler if you were against a friend or something. my favourite is cart surfer through and through its easy fun and u get loads of coins! i play cart sufer cuz i can get 300 or more coins from playing it! I don't think it's 1000 I think it's 500. But it's a great way to earn money. My favorite games are gone fishing and aqua grabber! OMG! 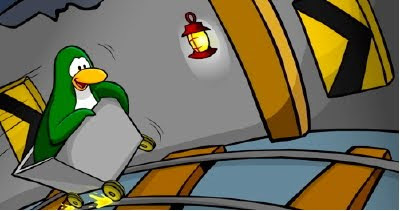 I figured it out... Club penguin just came out with a new collector's edition of Club penguin elite force and I think that it means there is gonna be a EPF 2. I'm not going completely solo on this. There has been a lot of waiting for the new mission and people have been saying that the EPF is going to join the next mission AND that the new person joining is Dot and I think there right BECAUSE maybe the next game isn't actually the "EPF" but something BIGGER!!! Think about it! I always play Cart Surfer if I want a lot of coins fast. How do you become a moderator. My favorite way to get coins is playing Puffle Roundup or Lime Green Dojo clean. They can get you a lot of coins! one thing is I get my money from puffle round up. the second thing is why hasn't anyonet thought of a silver puffle? Answer questions then put (CPG Mod) next to your name and you're set! Hey Syka, kkkkk, and hwnjanuary. Can I become the CPG11? You answer ppl's comments and congradulate them. Be nice, be correct, and be phunnie and warped! For more info on becoming a mod, and for the mod rules, visit the mod rules page. Their link is under the mod list. Good luck, and happy modding! No hard feelings, Gold! BTW her name is Hnw, not Hwn. ;-D See u at the debate! Good idea! Tell club penguin! puffle round up and dance contest! Who else...? Oh and what are the results of the "election"? Jet Pack Adventure? Yeah, that's fun! MIMO IM HAVING A BIG PARTY HUGE PARTY ON THE CP ON JANUARY﻿ 15 2010SEVER:Berg,REAL TIME:4:00-7:0pm,my iggy will be on the map but i will be hiding the place i will be in cove,town,coffee shop,lighthouse and the agent hq. EVERYONE WILL BE THERE!!! My fav game?.... You mean favs! Puffle round up and of course cart surf'n. Anyways I saw the poll! But :( Wheres a comet puffle? From outer space! But i voted for rainbow puffle..... PEOPLE VOTE FOR VIKING OPRAH THERE IS STILL TIME-HOPE! THE UNKNOWN!!! OOO Scary movie! I watched American Idol! It was totally hilarious! Did you see the guy who was practicing to be more assertive, and pretending to do so by saying "Shut up Simon!"? It was so funnalarious! (Pronunciation: Fun-A-Larry-Us) Simon is leaving after this season! He may be a sometimes mean jerkface (He has gotten nicer though...) but American Idol honestly isn't the same without Simon! Who agrees? Do they even GET American Idol in the UK? Australia? I think I posted this on the earlier post but here it is again! The way I make money is the Dance Contest! I'm an expert (Seriously, I play expert)! If u mean a club penguin gang mod, you just answers ppls questions like im doing for u. there are a few rules. look at the main page sidebar and the rules, or link, will be there. and put cpg mod by ur name. Mimo they have more flags! They have new flag pins! the new ones are... Costa Rica, Gatamala, Malaysia, Peru, Philipenes, Singapore, and Venezuela. I first one plz give me credit mimo! Cool! I hope Mimo gives you credit! Can you tell me when the party is coming? Please tell me in Twitter. Im one of your followers. Also if you want to get a lot of coins do DIFFERENT tricks everytime. And grind before turning. Press the down arrow key with the left or right key. The Club Penguin Membership Benefits page is updated! There will be a new room for members. heres a tip for penguins that "need, lots of $MONEY$"
First you have to answer questions and comments correctly and politely. Congragulate them. If you want more information check out the mod rules page. Good luck in becoming a mod! they were talking a lot about whats happening underground in the newspaper... Im sure that we will 'discover' the orange puffle in a cave. My favourite game is catchin waves! it is so cool and I always get lots of points!!!!! Kkkkkk123 (CPG MOD) GO CPG10! Hmm, good question! I think his favourite mod is YOU! Im 75% sure 'bout it! I used to play at least one mini-game everyday! But now, I have to do more important things lol! My favourite game is catchin waves! First, I couldnt understand when it first came out! Now, Im totally a catchin wave expert! Thats true! We can get lots of coins with Aqua Grabber but... Its quite hard to earn coins! And its not so easy to use submarine. Anyway, thanks for your help!! Keep commenting and sharing your tips! Hey there! Asking about moderators? Just read below! 2. Always be nice to people! 3. While you are answering question put (CPG MOD) beside your nickname! 4. Please do not put (CPG MOD) unless you are answering question. 5. Dont give up! Comment regularly! 6. There will be mod changes every month! You can be one of them too! 7. Once you became an officially mod, try to comment MORE and MORE! 8. If you are good at modding, you will be Super Mod, Legendary Mod, Mimo Mod and Mega Mimo Mod! And if you are one of the best moderators ever, you can be even a TOP MOD! 9. If you became a Mimo Mod, Mimo777 adds you on CP buddy list! 10. Keep commenting and modding! Whoaa, truee. Thats a nice idea! Thanks for sharing! I'm not sure if this cheat works anymore but at the end of Cart Surfer, wait until that white light comes. Then if you crash and lose it will double your coins you earn. Yes its cool i love the game! it's the most game that gets you coins in club pengin.